With the Wisteria in full bloom, Spring is upon us! And “Bud Burst” in the Pinot Noir not far behind! Did you notice the stick insect (Phasmid)? Suckering is the next major vineyard activity, where excess shoots are removed. Again the focus is on restricting the crop to maximize fruit quality. You can’t make good wine from poor fruit! And of course we get a little after hours suckering assistance from the elusive Grysbok! Flowering and fruit set follow. Canopies are managed throughout the growing season to ensure free air flow and exposure to sunshine without burning the bunches. With Pinot Noir being our first cultivar to ripen. And when the March Lilies bloom, the Cabernet Sauvignon is well on its way to optimal ripeness. And delivered to the cellar for pressing and fermentation. And then to slowly mature in French Oak barrels. After the harvest the vines continue to take up nutrients, creating carbohydrate reserves needed to develop early shoots in the following spring. Shortly after this the leaves drop and the vines enter a period of winter dormancy. Winter is the time to nourish the soil by planting cereal or legume cover crops. We plant the cover crop in every second row on annual rotation. Pruned vine canes are dropped in the unplanted row. A healthy cover crop enriches the soil. It is not harvested but is left in the vineyard to contribute to a carpet of organic matter. This assists in suppressing weed growth and importantly helps with water retention in the hot summer months that follow. Winter is also the time for pruning. We prune manually in three stages, with the key focus being on restricting the crop to maximize fruit quality. You can’t make good wine from poor fruit! During July we remove excess growth in a “brush cut” operation. In the second step around mid-August, next year’s bearers are selected in the “clean pruning” operation. Finally, towards the end of August/ early September, selected bearers are cut back to two-bud spurs. Shortly after our arrival on the farm in 1964, I accompanied my Dad to a livestock auction near Bellville in search of a draught horse to work in the vineyards. “No pull no pay” declared the auctioneer, as my Dad successfully bid for Sussie. It soon transpired that Sussie was in foal. I don’t recall whether it was just before the end of the year or just in the new year that Justin, a strapping young colt, was born. On the farm, Sussie’s main function was to plough a furrow on both sides of the vineyard rows, the so called “bankie”, from which the weeds were later manually cleared or “geskoffel” using a long handled spade. After delving into family albums we found the photograph below which, with some technological wizardry, was converted to digital format. A little unclear but one can see Sussie ploughing a “bankie”, with Justin getting an early introduction ahead. Sussie’s duties were relieved when we acquired Mr Plod, our part Flemish draught horse. It was however, time for mechanisation and we soon acquired a 1949 Ferguson tractor, locally known as the Vaaljapie. After years of working in the vineyards and trundling 2.5 ton loads of grapes to Stellenbosch Farmers Winery, our Vaaljapie was retired. Fortunately, I not only have photographs, I still have the real thing! And so began a refurbishment project. Now fully reconditioned and running! Our 2015 Pinot Noir paired with opening course. Great wines and delicious dishes made for a memorable evening! And an interesting finale, with our Pinot Noir 2015 paired with the sweets! We have one Shiraz vineyard of approximately 0.75 hectare. The vineyard is established on deep, well drained weathered granite soils and is located on the crest of a hill. The vineyard is trellised and the canopy managed throughout the season to ensure optimum phenolic ripeness of the grapes. Supplementary drip irrigation is applied. The crop is reduced to between 10 and 12 tons per hectare by suckering soon after bud burst, followed by one ‘green harvest’ later in the year. This contributes to high quality fruit. Grapes are picked by hand. Winemaking: Fermented with selected yeasts in semi-open fermentation vats. Made in a classic, low intervention manner without extended maceration. Matured for 24 months in new, second and third fill French Oak barrels, racked at intervals as necessary. Polished with a very light egg white fining. Aroma: The nose is characterized by ripe berry and plum aromas, with a hint of freshly ground black pepper. Palate: Ripe black cherry and dark plum flavours dominate, backed by black pepper and spicy notes. Fruit and oak are well integrated, with subtle vanilla flavours and a hint of mocha. This Shiraz is a rich, full bodied wine with a complex spicy mid-palate and velvety finish. Good to drink now but will continue to improve over the next 6 – 8 years if well kept. One of the mystiques of wine is why one vintage differs from another. A heavier crop harvested slightly earlier than usual contributed to the structure of this wine. Lighter in body and with a lower alcohol level of 13 %, though our distinctive Shiraz character still shines through. Garnet red with plum and berry flavours, backed by black pepper, spice and sweet vanilla flavours. Good to drink now but will continue to improve over the next 4 – 6 years. 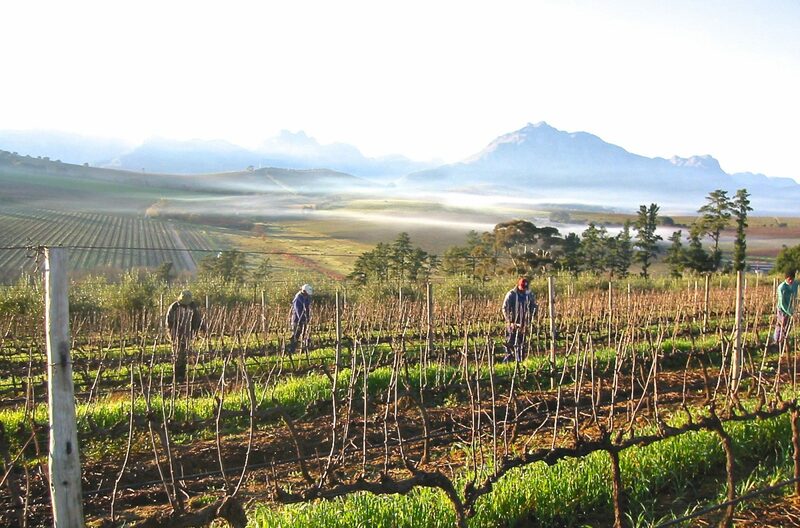 We have three Cabernet Sauvignon vineyards of approximately 0.75 hectare each. The vineyards are established on deep, well drained weathered granite soils and are generally located on north-east facing slopes. The vineyards are trellised and the canopy managed throughout the season to ensure optimum phenolic ripeness of the grapes. Supplementary drip irrigation is applied. The crop is reduced to between 6 and 8 tons per hectare by suckering soon after bud burst. This contributes to high quality fruit. Grapes are picked by hand. Colour: Deep red with bright purple rim. Aroma: Immediate blackcurrant and chocolate aromas on the nose. Hints of cedar and cigar box from the French Oak back these up. Palate: The blackcurrant flavours with cassis and plum notes contribute to a fruit driven palate within a structure of smooth, muscular tannins that continue to soften. Good to drink now but will continue to improve over the next 6 – 8 years. Pinot Noir is Burgundy’s most famous Noble grape. It has the reputation of being a fickle grape that demands optimum growing conditions but is well suited to our terroir and warm days followed by cool evenings. We have three Pinot Noir vineyards of approximately 0.75 hectare each. The vineyards are established on deep, well drained weathered granite soils and are generally located on north-east facing slopes. The vineyards are trellised and the canopy managed throughout the season to ensure optimum phenolic ripeness of the grapes. Supplementary drip irrigation is applied. The crop is reduced to between 6 and 8 tons per hectare by suckering soon after bud burst. This contributes to high quality fruit. Grapes are picked by hand. Winemaking: Fermented with selected yeasts in semi-open fermentation vats. Made in a classic, low intervention manner without extended maceration. The fermented must is lightly pressed and the wine aged for 12 months in old French Oak barrels to minimize overpowering the delicate wine with wood characters. Polished with a very light egg white fining. Aroma: Floral cherry and berry aromas supported by delicate forest floor aromas. Palate: Fresh red fruit flavours with light tannins. This vintage is characterised by mineral undertones on the taste. Good to drink now but will continue to improve over the next 3 – 5 years. We have three Cabernet Sauvignon and one Shiraz vineyard of approximately 0.75 hectare each. The vineyards are established on deep, well drained weathered granite soils and are generally located on north-east facing slopes. The vineyards are trellised and the canopies managed throughout the season to ensure optimum phenolic ripeness of the grapes. Supplementary drip irrigation is applied. The crops are reduced to between 6 and 10 tons per hectare respectively by suckering soon after bud burst, followed by one ‘green harvest’ later in the year. This contributes to the intense flavours of the wine. Winemaking: Separate fermentation of the two cultivars with selected yeasts in semi-open fermentation vats. Made in a classic, low intervention manner without extended maceration. Matured for 24 months in new, second and third fill French Oak barrels, racked at intervals as necessary. The two cultivars were blended and polished with a very light egg white fining. Palate: This blend of Cabernet Sauvignon and Shiraz brings out the best of the two cultivars. A well balanced wine with grainy tannins that will continue to soften. Fresh red fruit and ripe plum flavours dominate, with hints of chocolate, tobacco, black pepper and cedar.